If you happened to be in downtown San Francisco on the eve of the 1906 earthquake and were in the mood for booze, seafood, and other vices, you couldn’t do much better than coming to the future home of Mother Jones. Today, our building on Sutter Street houses other respectable outfits including an upscale bakery, Loehmann’s, and Craigslist. But back before the great fire obliterated it exactly 106 years ago, this spot epitomized the city’s old, seamy ways. 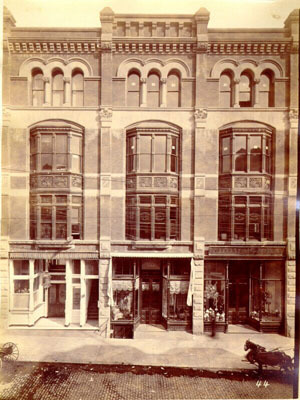 In 1877, a couple of Canadian brothers, Frank and Jesse Gobey, opened Gobey’s Saloon in the Rose Building at 228 Sutter Street. When Frank Gobey died suddenly at age 56 in 1895, the Chronicle stated that his bar and restaurant was “a notable gathering place for the inhabitants of the ‘tenderloin,’ but as it was always conducted in a quiet and orderly manner it was never the scene of any trouble.” Whether the reporter did not wish to speak ill of the dead or was being sarcastic isn’t clear, but it seems that Gobey’s was anything but staid. Men could enter Gobey’s Saloon via the door on the far left. Women and their chaperones had to sneak in the back. San Francisco Public LibraryJust a year before Frank Gobey’s death, the saloon was the site of a celebrated incident following the annual “big game” between Stanford and UC Berkeley. As football fans packed the bar, a young swell shot and wounded Stanford player Louis “Brick” Whitehouse and another patron. When the reporters arrived, Gobey was heard telling his staff to “say nothing to no one” about the shooting, much to the chagrin of the police. In 1895, Gobey’s was found to be serving counterfeit champagne, though only the distributor was charged. In 1897, Jesse Gobey was accused of running a nickel slot machine, but was let off. Other unsavory goings-on at Gobey’s were hinted at in the press. “There are upper and rear rooms at Gobey’s that could make strange and starting revelations if gifted with speech,” The San Francisco Call winked. In a July 1893 article titled “Pitfalls for Women. Scenes of Gilded Vice and Squalid Sin,” Call correspondent Marie Evelyn recounted a tour of saloons with a male colleague identified only as “Mr. Y.” At the time, the city’s many drinking establishments were considered off-limits to proper women, yet female companions could enter by way of the “ladies entrances” usually hidden in plain sight. Once inside, patrons could retreat to private, locked booths where men might lead women down “the flowery paths of vice,” as Evelyn put it. “Small wonder if a weak woman’s moral sense grows confused when such perversions are allowed by law,” she wrote. August 1884: Eleven-year-old Philomena Fry falls into Clara Lane while trying to pick some flowers from a window box three stories above. 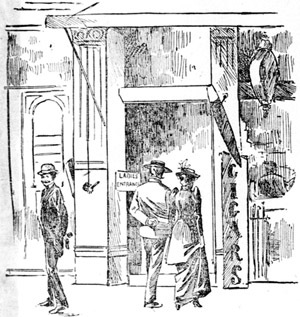 April 1887: Sixteen-year-old George Murphy survives being shot at after a quarrel with some men leaving the Fern Leaf Saloon. The suspect makes his escape down Clara Lane to Sutter Street. The 1906 earthquake and fire destroyed 490 square blocks of the city, including this stretch of Sutter Street. Gobey’s reopened nearby, but was said to be a shadow of its former self. Clara Lane became Claude Lane; Mary Lane is now Mark Lane. Smoothy the coke fiend and trigger-happy football fans have been replaced by 9-to-5ers and shivering tourists. But the MoJo building still has a rear door, possibly in the same spot where the ladies’ entrance to Gobey’s once welcomed anyone looking for a drink, a date, or a bite of oyster loaf. * The New Orleans Times-Picayune‘s Brett Anderson convincingly counters this crusty claim: “There is proof New Orleanians were eating sandwiches called oyster loaves and peacemakers before Gobey’s ever hosted its first scene of gilded vice and squalid sin.